Are your gutters functioning properly? Your guttering is a vital component in preventing water damage! Moisture can be a devastating enemy to your home. Your roof is only one line of defense against water intrusion. Without properly sized and correctly installed gutters, rain can seep into basements, deteriorate your foundation and compromise your siding. The guttering system is designed to carry rainwater from your roof to the ground level and move it away from your foundation. A properly installed and maintained gutter system is critical in protecting your home from water damage. 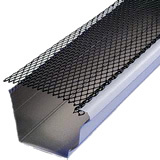 We offer heavy gauge seamless aluminum guttering in many different colors. Many homes have builder-grade guttering that barely meets the minimum requirements. Having the correct size of gutters on your home is key. Heavy downpours can overwhelm a gutter system that just meets the minimum requirements. Make important gutter maintenance easier! As for the maintenance, gutters must be cleared of debris to function properly. Remember, the gutters are there to catch and divert the water, not hold it. In some situations, clogged guttering can be more detrimental to your home than no guttering at all! Removing leaves, dirt and other debris by hand or with a garden hose is usually needed twice a year. But this important aspect of maintenance can be time consuming and dangerous. Furthermore, trying to rinse debris down the gutters can clog the downspouts. A high quality screening system installed by Morton Roofing can save you a lot of time by keeping debris out of the gutters. But not all screens are created equal. Most cheap plastic screens do not function well and break within a short time. We can evaluate your guttering and educate you... for free! Let Morton Roofing give you an honest, professional evaluation of your guttering. If changes are needed, we will give you recommendations and options so that you can make a well-informed decision. As with everything we do, our guttering system installations are designed to be the best possible solution for your home's unique needs. "A properly installed and maintained gutter system is critical in protecting your home from water damage." Our mission is to provide honest, friendly service in a professional yet creative way.